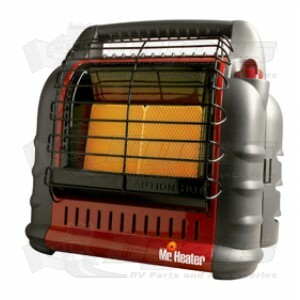 Heats up to 400 square feet of space for up to 220 hours (on low position). Ergonomic easy-carry handle makes it easy to take along in your RV, camper, tent and more. Dual-heating system (DHS) combines radiant heat comfort with convection heat airflow for maximum heating efficiency. Multi-position heat settings of 4,000, 9,000 and 18,000 BTU/HR control comfort level. Built-in oxygen shutoff sensor and tip-over switch ensures indoor safe operation with adequate ventilation. Low oxygen safety shutoff pilot and built-in tip over shut off switch provide safe, reliable propane heat indoors. 4,000 - 9,000 - and 18,000 settings. Large 4-position heat level control knob with built-In piezo starter and attached swing-open doors with swivel-out mount for easy cylinder installation. May be wall mounted.